I am certain you want to be involved somehow in saving souls. I know you want your congregation to grow because everyone is involved in that work. But if you’re like me, you’ve been hindered by a faulty model and a slight misunderstanding of Jesus’ teaching. I am convinced that if we can undergo a slight paradigm shift, we will get rid of the #1 hindrance to saving souls and pursue the #1 key to getting the job done. We’ve all heard of him. The man presented himself as a great disciple who had kept God’s law from his youth. But in the end, we find out that really he was only almost a disciple. I don’t want to be in that boat. I want to be a really, truly, totally and all the way a disciple. How about you? When I examine his story in Luke 18:18-23, I find three questions that will force us out of the shallow end of discipleship and push us into the deep end of true discipleship. Question #1: Do I live as though Jesus is merely good or truly God? The Rich Young Ruler called Jesus “good teacher” and Jesus called him on it. Jesus wasn’t questioning His own deity. Rather, He was highlighting a problem the man had. He called Jesus good, but did he really believe Jesus was the ultimate good? Did he recognize that Jesus was actually more than a good teacher and that He was God in the flesh? We listen to a good teacher when we want to. We listen to a good teacher when we like what he says. We listen to a good teacher as long as we still think he is good. We take a good teacher’s words as advice, something to do when we get around to it. That is not how we take God’s words. Jesus’ words are not just good advice, nice suggestions or possibilities. Jesus was more than a good teacher. He was and is God. Therefore His word is law. When we live as though Jesus is truly God, then we surrender to His word. When He says, “He that believes and is baptized will be saved,” we believe and get baptized. When He says “Don’t let the sun go down on your anger,” we don’t let the sun go down on our anger. When He says “Treat others as more important than yourself,” we treat others as more important than ourselves. Why do we do this? Because we know Jesus is not just a good teacher. He is the Great God. Question #2: Who is my God? The Rich Young Ruler said he had followed all the 10 commandments since his youth. 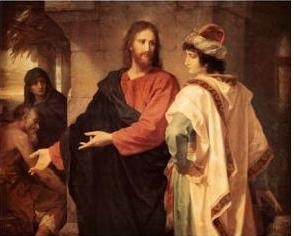 He had not committed theft, murder, false witness or adultery. He had honored his father and mother. What a great man he was. How could he not possibly be a great disciple and inherit eternal life? As we study this text, we realize this poor man actually was lying to himself. One of those commandments said, “Do not have other gods before Me.” Yet the Rich Young Ruler clearly had a god before Jehovah. His God was his material goods. He couldn’t possibly sacrifice them to have the eternal life God offered. Through that, he demonstrated who his real god was. So, who is your God? Learn the lesson of the Rich Young Ruler. We can easily lie to ourselves and tell ourselves that Jesus is our God and runs our lives. Instead of just trusting what we’ll say when put to the test, let’s examine our lives. Where do we spend our time? Where do we spend our money? Who are best friends? What would we not give up if God asked? These questions can help us cut to the chase. Or ask a friend. Ask your spouse. If you have kids, ask them. “What do you see is most important in my life?” They’ll be able to tell you and that can help you determine who your God really is. Don’t be like the almost disciple and simply trust your intellectual answer to the question. Dig deep and examine with rigorous honesty. Question #3: What do I value? At first glance, the Rich Young Ruler appeared to value eternal life. He came asking about it. Further, he claimed to have scrupulously kept the law since his youth. Even more, he was willing to go beyond that asking what more he needed to do. However, as we see the story unfold, we find out that he did not truly value eternal life. Eternal life was not a driving core value. It was merely an aspiration. He would like eternal life if he could get it but not at the expense of his material goods. Through we find out what was his driving core value–Money. He valued money and material goods. That drove his decisions. He would be happy to keep God’s law until God’s law told him to give up his goods. What do you value? Again, don’t just accept whatever you say when asked this intellectual question. We all know the right answer and can give it whenever asked. Instead of looking at this intellectual answer, we need to examine our lives. What drives our choices? Is it the pursuit of God’s kingdom and righteousness or is it the pursuit of wealth, fame and influence? Be careful. As we can see in the Rich Young Ruler, these are tough questions because we can so easily deceive ourselves. Don’t just ask them once. Ask them repeatedly. Question yourself like this regularly. Question your choices with these questions, especially those big life decisions like where will you work, who will you marry, where will you live, with what church will you work. Don’t be only almost a disciple like the Rich Young Ruler. Be all the way a disciple.